when i finally made it to andrew pearce’s house, i was so glad i recognized him. i had only seen him once–as the bartender of the marriot in bloomington where i stayed just once. but he smiles like nobody’s business and that’s how you know it’s andrew. he invited me in for a cup of tea to brace ourselves for the afternoon’s business–a photo shoot at a trainyard. in his kitchen i found this. . .
i was a little creeped out, but this is a project of adventure. of learning new things and this was definitely something new. if you know what it is, leave a comment. later today, i will post the pictures from the tracks, a video of me drawing fishnets on the cutest gal in all of bloomington indiana and then . . . one more mystery facebook friend experience! This entry was posted on Sunday, January 16th, 2011 at 3:21 pm	and tagged with andrew pearce, arlynn leiber presser, arlynn presser, facebook and posted in Uncategorized. You can follow any responses to this entry through the RSS 2.0 feed. « face to facebook modest victory! 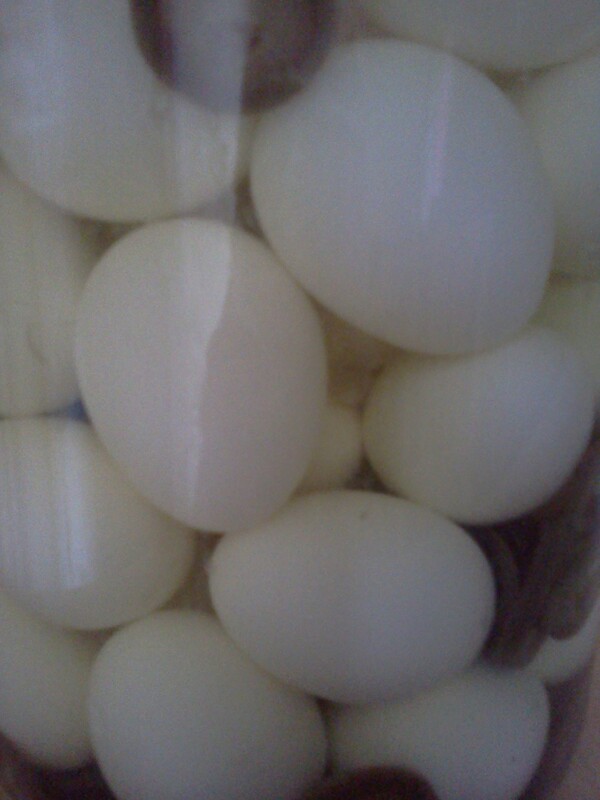 ummm….pickled eggs? If so, ewwww! janet, you are absolutely right! andrew opened the jar, i took a whiff and had the same reaction. ewwww! but he gets free beer for life from any pub that takes his eggs. and they are made from an old english recipe. final analysis: drunk people will eat anything! sorry, andrew, you knew that was coming!